Many young children are too heavy for standard car-safety seats, and manufacturers are starting to make heftier models to accommodate them, according to research on the obesity epidemic's widening impact. More than a quarter of a million U.S. children ages 1 to 6 are heavier than the weight limits for standard car seats, and most are 3-year-olds who weigh more than 40 pounds, the study found. Unless they are exceptionally tall, a 3-year-old weighing more than 40 pounds would generally be considered overweight. Lead author Lara Trifiletti said researchers at the Bloomberg School of Public Health at Johns Hopkins Hospital became interested in the topic because they saw children "who were very obese, and our car-seat technicians were having a hard time finding car seats to fit them." She did the research at Johns Hopkins but now works at Ohio State University's Children's Research Institute. Using inadequate car seats for heavy children could put the kids at increased risk for injury in a car accident, the researchers said. "We don't recommend that a parent use a restraint system for a child that has outgrown that system," said Eric Bolton, a spokesman for the National Highway Traffic Safety Administration. "It is risky." Unfortunately, some parents do without the car seats entirely — and that's a mistake, co-author Wendy Shields told CBS Radio News. "Parents, because the child is bigger, will make the assumption, 'Well, he's a big kid, you know. He doesn't really need the protection of a car safety seat,'" Shields said. Based on national growth charts and the 2000 Census, at least 283,305 children ages 1 to 6 are too heavy for standard safety seats. That includes nearly 190,000, or almost 5 percent, of U.S. 3-year-olds, the researchers said. "We would hope that families were working with their pediatricians to address the child's weight issue. But before that can be completely addressed, we need to make sure the child is safely secured in the car," Shields said. Their study appears in the April edition of Pediatrics, being released Monday. Trifiletti said the phenomenon mostly affects youngsters whose weight exceeds the limits of standard seats with built-in safety harnesses, which are designed for 1-to-3-year-olds weighing up to 40 pounds. These heavier young children are not mature enough or tall enough for "booster" safety seats, which are recommended for ages 4 and up and typically use the car's safety belts for restraints, she said. More than 23 percent of U.S. children aged 2 to 5 were overweight and more than 10 percent were obese in 2001-02, government data show. New data out later this week are expected to show that the upward trend has continued. Jenny Riggs of Tillamook, Ore., said she had difficulty finding a harnessed seat for her almost-5-year-old daughter, Hayley, who is heavier and taller than many kids her age — 46 inches and 46 pounds — and already weighed 40 pounds when she was 3. The $250 Britax "Husky" seat Riggs bought is about 10 pounds heavier and four inches wider than standard harness-style seats. "It's like a Lazy-Boy recliner," Riggs said. "It was a little difficult getting it in the back seat, but my daughter loves it." Hayley can use the seat for a while; it handles kids up to 80 pounds. Britax introduced two harness seats with 65-pound weight limits last year. The obesity epidemic "is something that we do keep in mind when designing our seats to make sure our seats are versatile in accommodating all sizes of children," said company spokeswoman Joyce Kara. 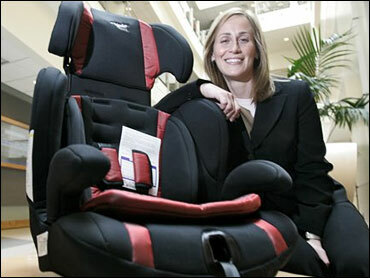 Dorel Juvenile Group, maker of Cosco brand car-seats, also introduced a harness seat last year for kids up to 65 pounds. Trifiletti said she did the study before last year's hefty models were introduced, when only four harness seats were available for 1-to-3-year-olds weighing more than 40 lbs. "They range in price from $240 to $270, so it may even be that a parent wouldn't be able to afford this kind of special car seat that their child would need," Shields said. The NHTSA last year proposed new requirements for manufacturers that choose to make seats for older and/or heavier children. Those who do would be required to build seats to protect kids up to 10 years old and/or weighing up to 80 pounds in 30 mph crashes. The agency also would create an 80-pound crash-test dummy for testing child safety seats, 25 pounds heavier than the existing simulators, Bolton said. The agency is collecting public comments on the proposal and a decision on whether to adopt the rule is expected soon, he said. "It's a problem for these children right now, and car seats need to be either tested for children at higher weights, or more car seats need to be manufactured that can accommodate larger children," said Shields.